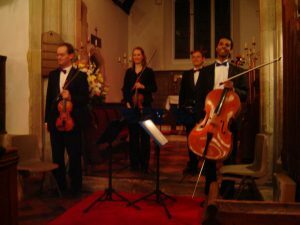 On Friday, the Manor House String Quartet gave a string quartet concert at St Giles Church, Cheddington – entitled ‘A Night At The Movies’ featuring popular classics featured in films. As usual, we spent the whole day rehearsing hard, with two hours of music to perfect for the evening. The rest of the group arrived around 11am and we got straight down to work, tackling the five trickiest pieces first when we were still fresh and knowing that much easier pieces such as Boccherini’s ‘Minuet’ (The Ladykillers) or Grieg’s ‘Morning’ (Raising Cain) would only need a quick run through. As we had decided to include the achingly beautiful ‘Adagio for Strings’ by Samuel Barber (featured in the movie Platoon), with this being 11 minutes long and full of double stops and fifths – often in a high register, this took a good 45 minutes before we were happy with it. After a day of intensive work, only breaking for lunch we were ready by about 6pm and two of us made the first trip up to the church to position music stands, chairs and publicity fliers for our next two concerts in Eaton Bray and Haddenham. As parking at the church is limited we usually try to take everything up beforehand so that (cello aside) we can just walk up with instruments and music later on. By 7.30pm, the audience were filling the church and as we were walking towards the church, we were welcomed by the sound of the church bells being rung (as half the profits from the evening are going towards the restoration appeal for the St Giles Church Bells) – and we all agreed this was a lovely and unusual way to start a concert. 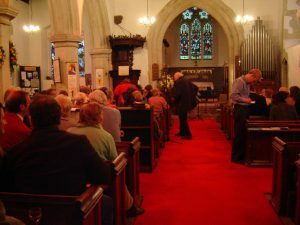 Although the church was not quite as packed as it had been at Christmas, there were still an estimated 85- 90 people in the audience and as we walked in, people were enjoying a complimentary glass of wine and seemed to be enjoying themselves already. We had tried hard to keep the concert programme very varied so that there would be something for everyone, mixing the more profound atmospheric pieces such as the Barber with much lighter, uplifting classics and we opened the concert with a really lively piece – Mozart’s Overture to the Marriage of Figaro which has been featured in many films, perhaps most prominently in the movie ‘Trading Places’. We had a very welcoming and enthusiastic audience who seemed to really enjoy themselves and as we usually stand up and talk a little bit about each piece beforehand, that helps to create an informal and inclusive feel to the concerts so that they are not at all stuffy or stifled. Best of all, we’ve just heard that the evening has raised ¬£356 profit towards ‘Cherish Your Church’ and the bell restoration – so as well as being a social event within the village, we’ve helped to contribute to something really worthwhile. We are already looking forward to our Christmas concert at St Giles, but before then we’ll be turning our minds towards ‘Travellers’ Tales’ – our concert in nearby Eaton Bray taking place on the 5th of June. As this will be our first concert at St Mary’s Eaton Bray we are working hard on publicity and hope that a few of the audience from Friday night might also come across and hear us again.